Adoring an innocent, Anne Stewart was seduced by Dominick Saint Georges, Viscount Lyons, then brazenly abandoned on their wedding night. Now four years have passed, and England’s most mysterious lord has returned to Waverly Hall. Anne can never forgive Dominick for the shame he caused her. She is determined to resist his advances and ignore the gossip and speculation surrounding them. but shocking revelations and deadly intrigues are drawing her ever closer to her enigmatic husband, to whom she dares not surrender again- this secretive stranger who holds the key to her survival…and her heart. 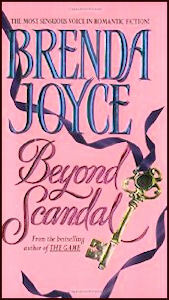 Brenda Joyce is a dreamweaver who spins spells that entice and enchant, a masterful creator of unforgettable characters and incomparable romance-from the spellbinding medieval passion of promise of the rose to the breathtaking sensual intrigue of the game. It was a perfect summer day: warm, sunny, cloudless. Perfect except for one fact. It was the day of the marquis of Waverly’s funeral. His death had been both sudden and unexpected. He had only been fifty years of age, and his health had appeared to be good. And his father was still hale at seventy-four. Then, very suddenly, he had become ill with the influenza. Within days he was dead. Because Waverly was being buried in the country, only a hundred mourners now gathered at the grave. The local gentry, squires and tenant farmers, rubbed elbows with dukes and earls, and they in turn brushed up against the entire village population of Dulton: bakers, butchers and furniture makers, dairymaids and shepherds. No one had come out of affection for the late marquis. Philip St. Georges had been a reclusive scholar, one who had spent most of his time out of the country journeying to exotic places. Respect brought some. Duty brought everyone. Duty to Waverly and duty to his father, the duke of Rutherford. Even the queen had sent her regrets. But one and all murmured about how odd it was that Philip had specified that he be buried in the country at Waverly Hall, instead of at the mausoleum at Rutherford House with his many illustrious ancestors. Anne did her best to comfort the duke, who had become her support during the past few years. She slipped her arm around him while he wept for his only child, his only son. And although Anne had never been close to, or even fond of, Philip, she had become fond of his father. His grief became her grief. Her vision blurred as the pallbearers appeared, the coffin on their shoulders. She had only attended one other funeral in her short life, and that had been her father’s, when she was ten years old. Anne remembered far too vividly the pain and anguish and grief. But that funeral had been nothing like this one. Her father had been a drifter and dreamer without means, and she had been completely alone, without any other family, and only a handful of neighbors she did not know had attended the brief, bare ceremony in Boston. No one had come to the grave except for the preacher. Soon after, she left America, never to return. Anne gripped the duke’s arm more tightly, stealing a glance at his ravaged face. She sympathized with him completely, wished to take away his pain, even though she knew she could not. In the past four years he had been her dearest friend. Waverly’s wife, now the dowager marchioness, tossed a single white carnation into the grave. Clarisse’s face was as pale as the finest ivory, her blue eyes sheened with tears, but she held herself erect. No one approached her to comfort her, no one dared–not even Anne, who wanted to, in spite of their differences. Dirt began to spill on top of the coffin. The crowd rippled. Restlessly, or for some other reason? Anne did not care. She had been careful to ignore everyone all day, as they had ignored her for so many years, but because she stood at the duke’s side, it had proved impossible. The villagers who had laughed at her and condemned her through the worst period of her life, the gentry who gossiped about her but never came to call upon her, the nobility she had not ever met because she did not dare go to London, not even once, one and all now pressed her hand and murmured their condolences. Almost fascinated, Anne watched each mourner turn to the duke. Their expressions changed. The villagers were anxious, the tenants reverent but nervous, the gentry respectful but still, somehow, cautiously reserved. His own class was respectful yet openly concerned. More than a few of his peers embraced him warmly. Anne felt another surge of sorrow, but not for herself, for him. The crowd seemed to shift uneasily. Or was it with curiosity? A murmur seemed to follow in its wake. Anne became aware of heads turning. Her gaze turned as well. And for one instant, she thought her entire world had disintegrated. On the ridge above the grave, Anne saw the black lacquer coach with the huge silver Lyons crest emblazoned upon its door. Four black horses champed at their bits in the traces. Two coachmen in black-and-silver livery held the reins, and two footmen, similarly unformed, stood upon the back runner. The door was flung open. Anne became utterly still. It seemed that even her heart ceased to beat. And Dominick St. Georges stepped from the coach and paused, silhouetted sharply against the brilliantly blue sky. Anne began to shake. His golden head was bare and held high. His broad shoulders seemed impossibly wide, his legs longer than Anne remembered. He was too far away for Anne to discern his expression. But Anne did not have to see his face to recall his every feature. His was a face she would never be able to forget–no matter how much she wished to. How she hated him. Because of him, she had suffered for the past four endless years, accepted by no one, condemned as something she was not, considered an outsider, notoriety clinging to her like her very own clothes. Because of him. And he had not shared her shame. Anne could not move, she could not breathe. He had come back She had not been sure dig he would—not even for his own father’s funeral. Her breathing was jerky now, small, sharp, hurtful little breaths. And she had thought he could not affect her any more, but no, she was wrong. He could still affect her, as much as ever. Anne told herself that she would be strong now, especially in front of the crowd who had gathered to lay Philip St. Georges to rest. In front of the crowd who had accused her years ago of being an American adventuress. If she appeared shaken or distressed, everyone would think that she still loved him-perhaps he would even dunk it, too. Anne had learned the hard way how to be strong—it had been a matter of survival.